Maria Montessori taught that every living being has a cosmic purpose, a reason for existing, a role to play in the universe. And we lovers of words in the Cedar room know that in every story and utterance, in every sentence, every single word has a role to play. As explorers of our language, we investigate and classify our words to understand those roles. People, places, and things, for example, are nouns. Articles (there are only three of them) are little but important words that can tell us quite a bit about the nouns with which they’re paired. Adjectives can tell us even more about those nouns, describing them in myriad ways! Together, articles, adjectives, and nouns are a family, and the phrases they make when combined paint pictures of our imaginations and our world. Recently in the Cedar Room, we’ve been thinking about adverbs. The verb, the action word, makes a sentence, and no sentence is complete without its verb. The adverb, though, is a great partner to the verb when it’s around. The adverb tells us more about the verb, about how the action happens, or when. Our adverb activity box is helping us to enjoy a variety of actions. For instance, we can run out of the room quickly, and we can walk back in slowly. We can hug tightly (if the other person wants a hug, that is), we can shake hands firmly, and we can high five gently. We practice our reading skills when we’re thinking about the roles of words. For instance, in order to match of the noun of an animal with the verb of the sound that animal makes, we need to read those words. Of course, in Cedar, we can always get help with reading words that are tough for us, if we need it. 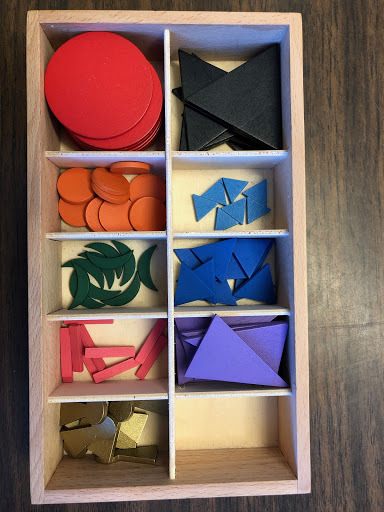 In the Montessori classroom each type of word, or part of speech, has an assigned color and shape. 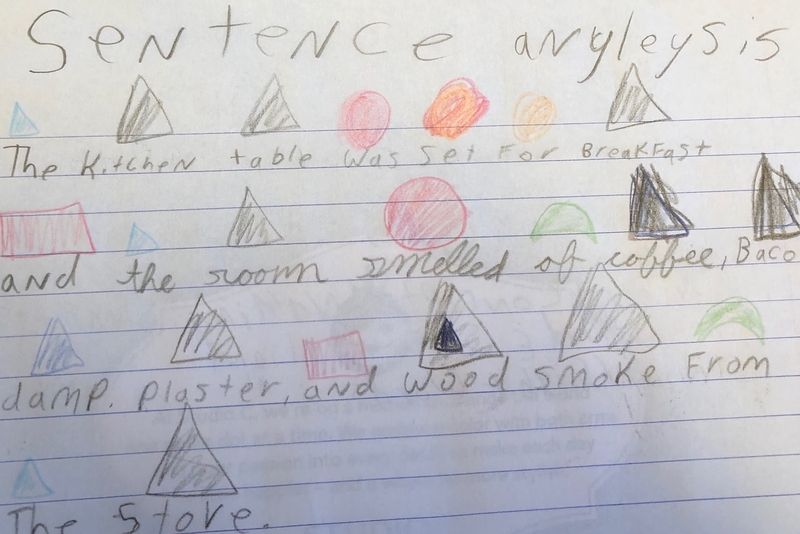 Nouns, adjectives, articles, and pronouns are triangles of various shades and sizes. Verbs and adverbs are round like the sun on whose action we depend for life on earth. Each student learns these symbols and practices classifying words in sentences by labeling them with their part of speech symbols. Children draw and color the shapes over the words in sentences. By the time they move on to upper elementary, our young learners are ready to become writers with fine senses of the role each wonderful word plays in each sensational sentence!